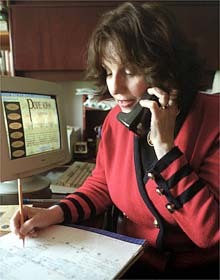 Donna Woolfolk Cross is one of an increasing number of authors who promote their books on the telephone, in person and on the Internet. he May meeting of the BedfordShire Book Group was a bit out of the ordinary. There was the usual chitchat — the 12 members, all women, live in the same condominium complex in Bedford, Mass. — until the telephone rang. On the line was Donna Woolfolk Cross, the author of the group's reading selection. For the next hour and a half, via speakerphone, Ms. Cross led a discussion about her historical novel, "Pope Joan." "I was just amazed that an author would take the time to do this," Roz Ault, a member of the club, said via e-mail. "She was so enthusiastic and totally involved in the conversation." Ms. Cross has a lot of experience. Her book had only modest sales in hardcover. But since "Pope Joan" came out in paperback nearly four years ago, she has placed calls to more than 350 book groups, sometimes devoting four or five evenings a week to the practice. Many of those discussions result from her World Wide Web site, popejoan.com, where Ms. Cross offers to call any group that chooses the book, and word has traveled fast online as well as at some bookstores across the country. The phone calls are part of a wide- ranging personal marketing strategy by Ms. Cross that has involved only minimal involvement by her publisher, Ballantine Books. She is an example — if an extreme one — of a new wave of authors who have turned to such efforts to reach readers, and in particular, the increasingly powerful book clubs. And while their efforts may not land them on the best-seller list, these writers keep their books alive and in print. "In these hard times for publishers, a writer who can do this kind of grass-roots marketing becomes a much more valuable property," said Daisy Maryles, executive editor of Publishers Weekly. "Not to say that all authors could go the lengths of Donna Cross, but they certainly have to do more than they once did." It would be hard to imagine an author who has done more to market her book than the relentless Ms. Cross. The hardcover edition of "Pope Joan," her first novel after several nonfiction efforts, quickly went out of print in 1996 after a printing of 13,000 copies and little promotion by the Crown Publishers imprint of Random House. She felt the disappointment keenly and vowed that the United States paperback edition, published by Ballantine the next year, would not meet the same fate. "I felt I owed it to the book, on which I spent seven years of research," she said. "The paperback was my second chance." The historical novel is about Joan, a controversial — some say mythic — ninth-century Englishwoman who posed as a man to become a monk and rose to the papacy for two years. The story, packed with period detail, follows Joan's gender-bending ascent against the background of the sacking of Rome and the Battle of Fontenoy-en-Puisaye, perhaps the bloodiest medieval conflict. Although the book has never made an American best-seller list, Ms. Cross has made good on her second chance: nearly 100,000 copies of "Pope Joan" are in print and it is gaining, not losing, momentum. The most recent printing, its ninth, was its largest at 20,000 copies — unusual for a book so far removed from its original publication date. And with the filming of "Pope Joan" to begin next year by Bertelsmann's UFA production unit, its prospects are even brighter. A former professor of English at Onondaga Community College in Syracuse, Ms. Cross, 54, was inspired by the heroine of her novel. "Writing about Joan helped me," Ms. Cross said. "She was a strong, bold woman. I had to become a great deal bolder to fight for this book." Because of her unusual topic, Ms. Cross has spent more time on the lecture circuit than at bookstore signings — and happily so, she says. In addition to being paid for her appearances, she sells far more books at lectures than at signings. After a recent speech before a large gathering in Lansing, Mich., for example, more than 250 copies sold in less than an hour, said Karen Douglas, an organizer of the event. But the most time-consuming part of Ms. Cross's promotion is the outreach to reading groups. By some estimates, tens of thousands of such groups exist around the nation. "Publishers have become much more savvy about this market," said Donna Paz, founder of Paz & Associates, a consulting firm in Nashville that publishes a yearly guide to new books aimed at reading groups (www.readinggroupchoices.com). "Their catalogs are full of references to `discussible' books." Indeed, "Pope Joan" was one of the first books in the Ballantine Readers Circle, a special marketing campaign aimed at reading groups that now numbers nearly 100 titles. The paperback edition includes an interview with Ms. Cross and a reading group guide. But while other authors, like Chris A. Bohjalian ("Midwives") and Anita Diamant ("The Red Tent"), have successfully reached out to this market, "there's no one I know who puts herself out there to the extent Donna Cross does," Ms. Paz said. "Think of all the people she has met along the way." Those thousands of people may well form a built-in audience for her next novel, which Ms. Cross is still writing. "I can't wait for it," said Ms. Ault, of the BedfordShire reading group. "Her phone calls won't sell as many books as an `Oprah' appearance, but it certainly makes her much more special to the readers she does reach." But this success has come at a cost. Ms. Cross devotes so much time to marketing "Pope Joan" that she has been slow to finish her next book — a historical novel, with a female protagonist, set in 17th-century France. "Pope Joan" was such a hit in Germany, selling two million copies, that the German publisher Aufbau-Verlag gave her a six-figure advance for the coming book. That and the sale of film rights to "Pope Joan" have given her sufficient financial freedom that she plans to wait until she finishes the new novel to sell its American publishing rights. So why keep working so hard to inch up the American sales of "Pope Joan"? Ms. Cross, still bitter about her experience with the hardcover edition of the novel, explained: "I need to stay true to this book as long as I can. I have worked a little too hard and cared a little too much."